Regular Package $55 A variety of chocolates, nuts, cookies, candies, pretzels and sparkling grape juice. Deluxe Package $70 An assortment of dried fruits, boutique teas, pretzels, chocolates, hamantaschen, chips and a premium bottle of wine. 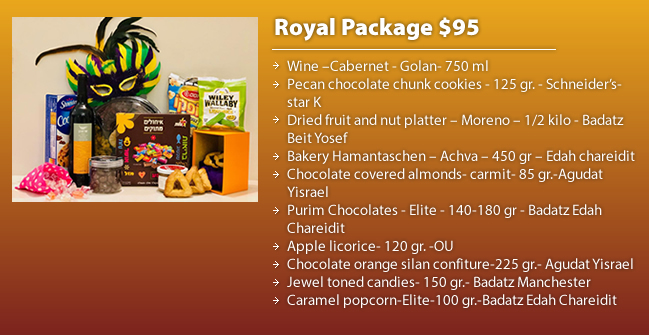 Royal Package $95 A large variety of dried fruits, nuts, hamantaschen, cookies, chocolates, candies licorice, popcorn and a superior bottle of wine. 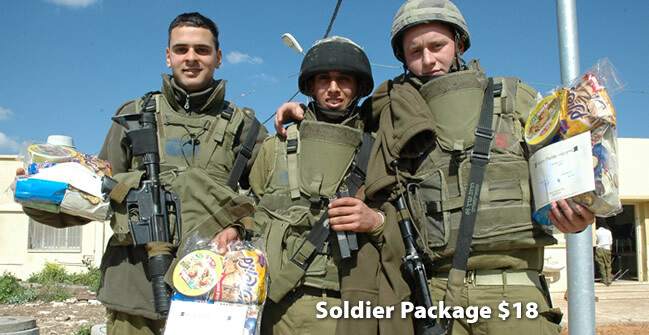 Israeli Soldier $18 Our volunteers will select & visit several IDF bases & distribute Mishloach Manot to the brave men & women protecting Eretz Yisrael. Above prices include delivery - no hidden charges! Order Now! We deliver anywhere in Israel - from Efrat to Eilat, from Beit Shemesh to Beer Sheva! 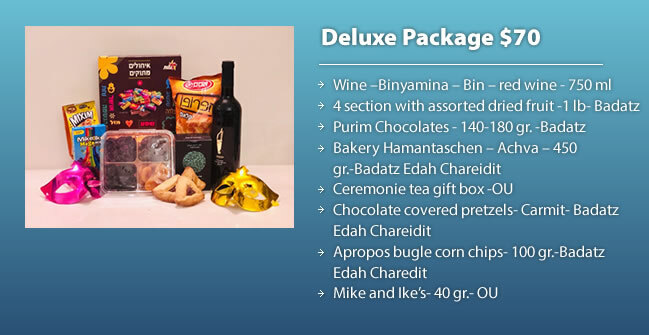 The deadline to order Mishloach Manot is Friday, March 15th. 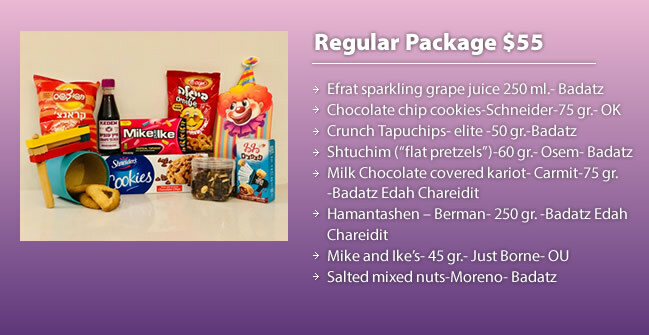 All packages will bear a card noting your name and address with a Purim greeting. All items are under strict Kashrut supervision. Packages sent to students will contain grape juice instead of wine. All proceeds assist programs and activities in Israel under the auspices of IYIM: International Young Israel Movement – Israel Region. All prices are in US dollars and include delivery. Delivery will be attempted at the recipient's address unless regular mail is delivered to a local post office. The site is now closed for Purim 2019 - See you next year!